A typical real-life data set is affected by inconsistencies—cases characterized by the same attribute values are classified as members of different concepts. 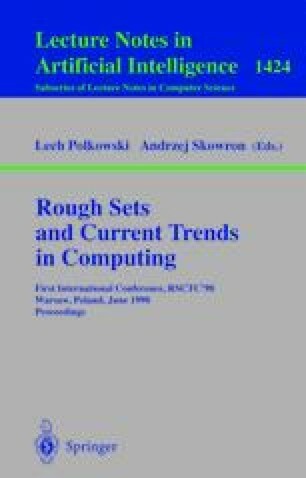 The most apparent methodology to handle inconsistencies is offered by rough set theory. For every concept two sets are computed: the lower approximation and the upper approximation. From these two sets a rule induction system induces two rule sets: certain and possible. The problem is how to use these two sets in the process of classification of new, unseen cases. For example, should we use only certain rules (or only possible rules) for classification? Should certain rules be used first and, when a case does not match any certain rule, should possible rules be used later? How to combine certain and possible rules with complete and partial matching of rules by a case? This paper presents experiments that were done to answer these questions. Different strategies were compared by classifying ten real-life data sets, using the error rate as a criterion of quality.